Kunisaki has been a religious and spiritual center since Heian period. The whole region is dotted with Buddhist temples. Kunisaki peninsula, a less traveled part of Kyushu, has been on my radar for a long time. 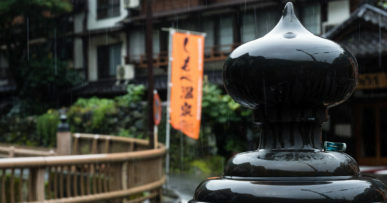 It’s one of the well kept secrets of Japan, a place with a strong connection to ascetic practices of shugendo. The thing with Kunisaki is that because of its relative remoteness it’s almost inaccessible by public transport, especially the mountainous inland part where most of the sights lie. There are some bus tours for domestic visitors, but I’m not a fan of bus tours. So I’ve been saving this trip for later, for many years until I finally felt confident enough of my driving skills (acquired rather late in life) to try driving in Japan. I rented a car, and made this trip happen. And it was quite unforgettable. There’s nothing grand in Kunisaki – the temples and shrines are on a smaller scale, the landscape is not particularly dramatic. Here it’s all about the atmosphere, the spiritual essence of the place. The land is ancient – not exactly unspoiled, but alive with wonders. 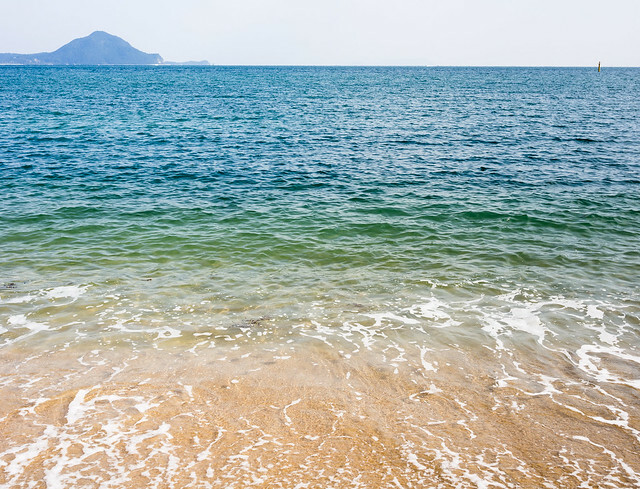 There’s so much to experience on Kunisaki peninsula. Two days are definitely not enough. I arrived on a train from Kokura and picked up my car from the small rental outlet near Usa station. It was already past noon. After spending some time at Usa Jingu, a short drive from the station, I still had enough daylight to head into the peninsula’s mountainous part and cross a couple of locations off my list. Sannomiya-no-key, advertised as a river gorge with interesting geology, was rather underwhelming, but Makiodo compensated for that. There used to be a larger temple there at some point in history – now only the marvelous Buddhist statues remain, exhibited in a hall built for this purpose. Other than that, there’s not much to see. While searching for Sannomiya-no-key I made a wrong turn and discovered a day use hot spring, Yamagata Kazenosato. Having finished with Makiodo, I drove back there and had a nice soak before heading to Bungo Takada for the night. I stayed at Hotel AZ, which was something like a Japanese version of a motel. Large convenient parking, very basic facilities, and very decent breakfast. Next morning I drove along the coast first, following national route 213, making stops whenever I felt like it. Mitama Kaigan is said to be famous for its sunset, but to that I cannot attest: wrong time of day. 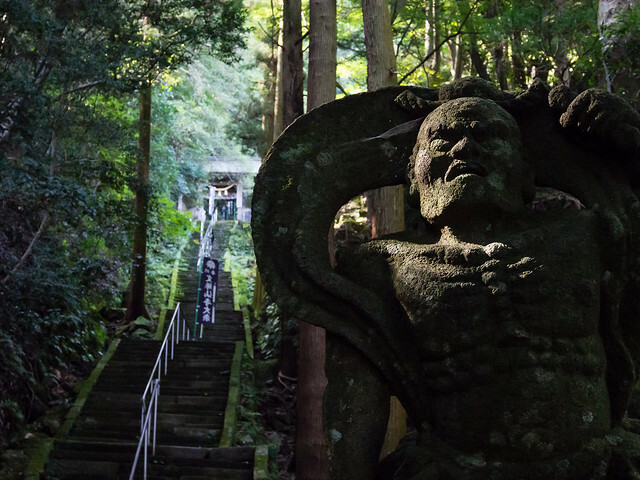 Awashima shrine was an unexpected gem – small and atmospheric, I had a powerful spiritual experience there. Kunimi seaside park makes for a nice convenience stop – there’s a rest area for drivers, and beautiful sand beach with nice views of the sea. And my last stop along the coastline was Kushiki Iwakura shrine – a medium-sized shrine in park-like settings that hosts an unusual local festival in October. After that I headed inland where all the major sights are. Kunisaki peninsula is known for its spiritual tradition that blends Buddhist, Shintoist and shugendo practices. The mountainous inland region is dotted with small temples, many of them make use of local topography by having part of the temple built into the mountain (there’s many grottoes here and caves). 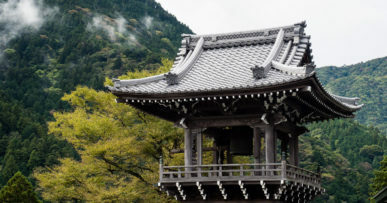 Those mountain temples are very unlike city temples and even larger temples complexes in places like Nara and Kyoto – they have a totally different feel. And some parts of the region are virtually free of people. It’s precious in this day and age. For instance, when I arrived at Iwatoji there were no other cars, and no one around. I didn’t see a living person for the whole 40 minutes – after that a Japanese couple arrived by car, but it was only us on the temple grounds. In Monjusenji there were about 5 people total, and in Futagoji, of course, more, because it’s the largest and most visited of all Kunisaki temples, but it was still very far from crowded. I absolutely loved all the temples I got a chance to visit that day, and would happily come back to Kunisaki. They say there’s 33 temples remaining here. I’ve only been to five. Driving in Kunisaki can be… adventurous. Look at my drive on the map and zoom in on the section between Iwatoji and Futagoji – you’ll see what I mean. Roads in Japan are narrow in general, mountain roads – in particular. That section is a one lane road with occasional incoming traffic, through the dense forest with tree branches scraping the car sides, sometimes there’s fallen branches on the road. The curves are sharp with zero visibility, road mirrors somewhat help, but if the incoming car is going too fast there’s a chance you simply won’t have enough time to slow down and figure out how you’re going to pass each other. It’s dangerous and you have to be very careful. I’d recommend going around using bigger roads, if time allows.